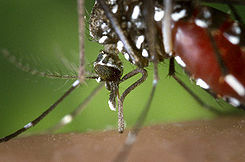 Dallas County has 190 confirmed cases of West Nile Virus, including 10 tragic deaths. In an effort to control the outbreak of this disease, local officials – under the advisement of Texas State Health Officials and the Center for Disease Control (CDC) – have authorized aerial spraying of a pyrethoid insecticide for mosquito control. My office has received several questions recently regarding the safety of this method, and I would like to take this opportunity to share information and studies on aerial spraying with you. Additionally, I have included resources where you can find the most up-to-date information on what is happening in your neighborhood. The EPA and CDC say no unreasonable risk comes from the kind of chemical that local agencies are already spraying from trucks and could start spraying from aircraft later this week. The risk is low enough, the EPA said, that exposures could increase from new products without creating a problem. “The assessment shows that even if the highest levels of exposure were to occur, risk estimates for adults and children would be well below the agency’s level of concern,” the EPA said in a summary of its findings. The CDC has also initiated numerous studies to determine the safety impact from aerial spraying of insecticides for mosquito control. Three of the CDC’s study findings are summarized in a report you can view by clicking here. According to the CDC, you should use mosquito repellent, eliminate standing water where mosquitoes lay their eggs, install and repair window and door screens and support local mosquito control programs. Even with reduced or low risk, everyone should take the appropriate precautions to protect yourself from the West Nile Virus, as well as check the scheduled spraying times with local authorities. They will occur during the night, so please make sure that you and your pets are inside while the spraying activities are taking place. If you have any further questions, please visit the CDC website and the Dallas City Hall’s aerial spraying update website. As always, you can reach my office in Dallas at 972.392.0505 or DC at 202.225.2231.